So, I have danced around the issue of my TV not working for at least 6 months. If you would notice the intense red in the image to the right and then add some neon pink to that, it's what "white" people's skin had started looking like. Any darker skin tone went seriously close to black paint. And this was assuming the TV would come on at all. Right before I left for my May Virginia trip, I decided the TV had died and my idea of giving a new one to myself as a Christmas present became a bit unlikely. See, we're in the fall season right now; the time of hot cider, warm butternut squash soup and Iowa Hawkeyes football on ABC. /sigh. When you can't get your TV to even turn on reliably, the idea that you're going to watch said Hawkeyes from the comfort of your recliner with a cat firmly ensconced in your lap becomes less likely. I need a new TV. 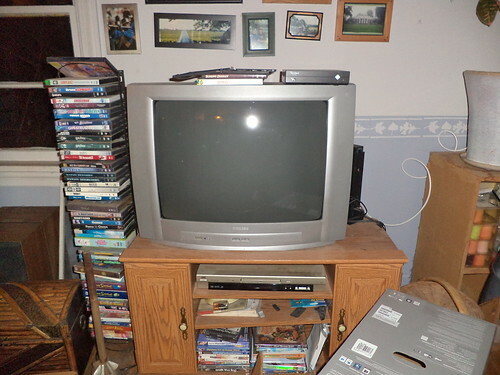 It took some saving and cutting back on other things, to have enough to buy a TV. But my technophobia was getting the best of me. I looked at deals online and they might as well be speaking Klingon for all that I understood. One of my guild mates, who lives southeast of me, offered to take me around and look at all my options, explaining what I needed to get set up and making suggestions on what would be a good TV. 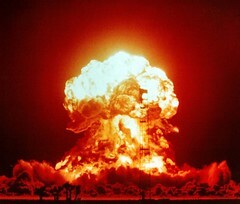 Plus, he'd set everything up so there would be no nuclear explosion because I connected the wrong wire. Why didn't I go larger, you're wondering? Well, this is the original set up. That's 25 inches of tube. To the right is my Play Station 2 which needed to be connected to the new TV. On the top shelf is my DvD player. I use it to play movies and CDs when I'm crafting in the living room. A new TV had to fit in this spot. Larger just wouldn't work. You need to understand that I'm not a "typical" television consumer. I don't have cable or satellite. If I could pick and choose exactly which stations from cable I could have, I would sign up in a minute. But if I want the Big 10 network, which would give me all the Hawkeye football and basketball games, I have to have things I will never watch. Why should I pay for 85 channels when I only want 6? I am also blessed in the Chicagoland area that we have a plethora of free channels. If I want to watch MeTV, I have 3 channels from which to choose. PBS has 4 separate channels including a Spanish language one that tends to show travelogs when I'm channel surfing. Then it doesn't really matter what language comes through the speakers. The scenery is what matters. Here's the new set up with Mission: Impossible on the TV. What a difference. I had to get a new antenna but no more is the antenna duct taped to the east window in the hopes of picking up a signal. Clear and sharp, it was awesome. My friend also gave me my first Blu-Ray movie. "Listen. Do you smell something?" I was thrilled. The only down side was that the local primary stations weren't coming in. I couldn't, initially, get CBS, ABC, NBC or PBS. I got the FOX station, but football is carried on ABC. I needed to figure this out. So, I resorted to (gasp) reading the instructions and discovered how to make the TV search for missing channels. 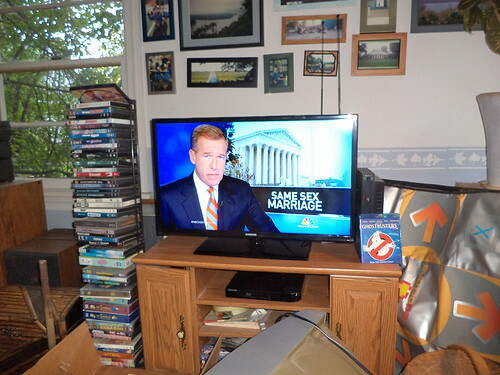 Last night, for the first time in over 6 months, I watched the NBC Nightly News. Wow. Skin colors that are actually the right color. There can still be an occasional degradation in signal which can be maddening when you're focused on a segment you feel is important, but it's less than it was when I had to run the signal through a converter box. I need to tuck the DDR pad behind the stand. The local news is, primarily, what I am usually watching on television. I missed that as my computer news feeds don't seem to reliably pull in local events. It's quite the change. I am thrilled with this and so glad Jim could come along and help me. I took the empty box to Pam's on Sunday. My recycling can is full, at the moment, so the box would just sit around for another week until my can was emptied. Her recycling can was empty. 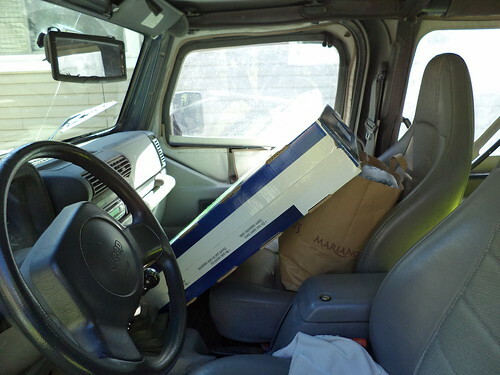 I would have been really, really nervous about transporting the TV from Best Buy to my house in my Jeep. It would have fit, but I would have worried. Jim drives a big Jeep so we could lie it down flat and anchor it so it would not slide. I am now, dear reader, in the 21st Century. 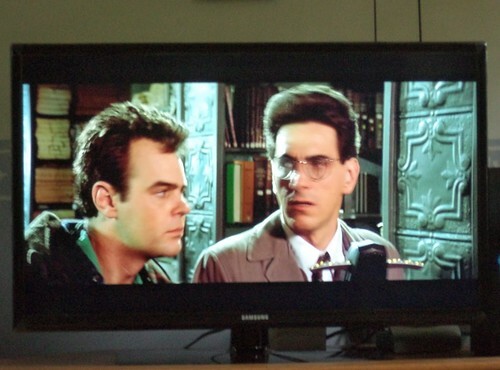 I watched part of "Ghostbusters" on Saturday. I want to try some of my other DvDs just to see how they look, and start up Final Fantasy X to see how it looks. I'm starting the next phase of crafting so "background" music will become, once again, a reality. 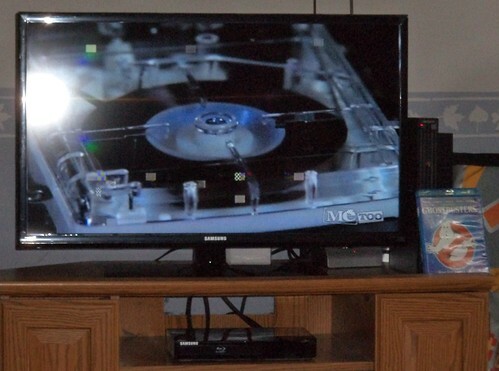 The TV is going to Wheaton's electronics recycling event on Saturday. I've started accumulating the printers, cables and other electronic pieces that go. Pam and her hubby are coming to get the TV on Friday as it's a behemoth to move and they will bring the van for it. My other options were to find an neighbor to move it into the Jeep and pray that it fit in the front seat or roll it to the curb. The garbage company will take electronics but you have to sticker them. Jim and I celebrated the purchase. 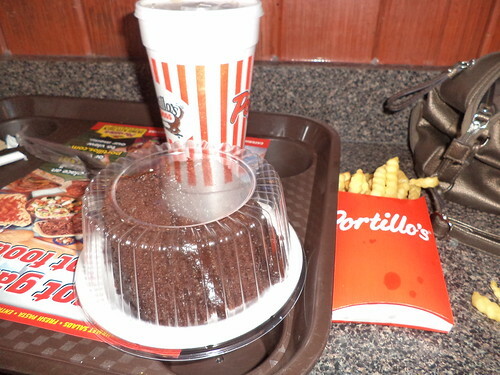 You can't go wrong with Portillo's. The whole day set me back less than $500, which is, to my mind, a real bargain. There is room behind the TV for a cat to sleep, but they have never been interested in resting on top of the TV so I don't know if someone will, eventually, figure out there's space back there. I guess we'll see. So, bring on college football. I'm ready. I am still working on upgrading to the 21 century. 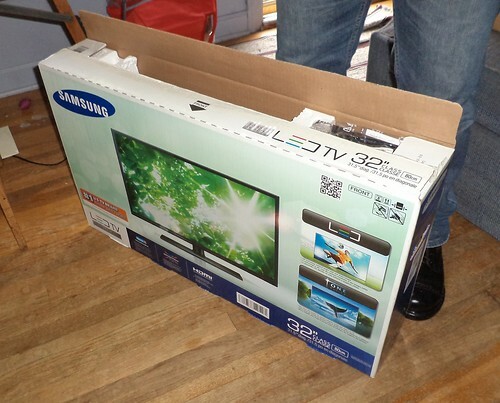 my new TV will also be my monitor.